Dubliners with statues outside of Ireland | Come Here To Me! « The first traffic lights in Dublin city centre. Arthur Wellesley,The Duke of Wellington. A two-time Tory Prime Minister, and the man who oversaw the passage of the Catholic Relief Act in 1829, Wellesley was born in Dublin on 1 May 1769. Wellington is perhaps best remembered for his decisive victory over Napoleon at the Battle of Waterloo in 1815.He is remembered by the Wellington testimonial in Dublin’s Phoenix Park today, and the Ha’penny Bridge was originally christened the Wellington Bridge in his honour. Wellington is remembered with numerous statues across the UK, for example in Leeds, Edinburgh, Glasgow, Manchester and London. 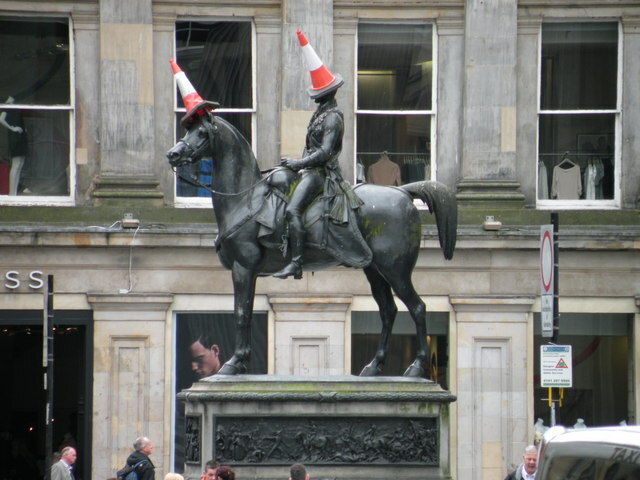 The Glasgow statue is rarely found without a traffic cone on its head. 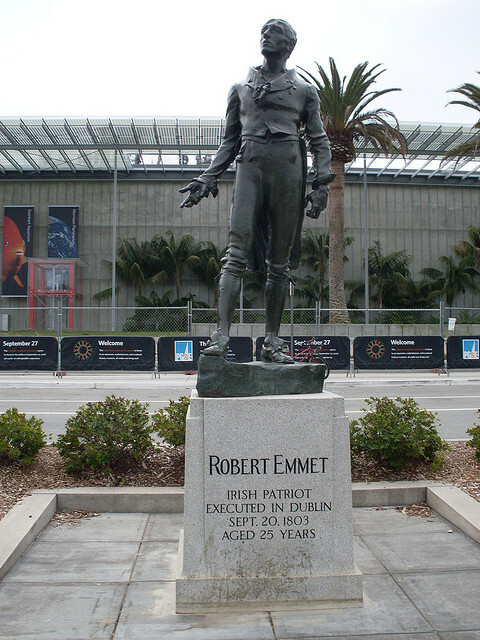 Robert Emmet, born at St. Stephen’s Green in March 1778, led the uprising of 1803 against British rule and was executed as a result. Remembered primarily for his excellent speech from the dock, Emmet has become one of the more romantic figures of Irish nationalism. There are four identical examples of Jerome Connor’s monument to Emmet to be found, located in Washington (on ‘Embassy Row’), San Francisco, Iowa and here in Dublin at Stephen’s Green. Born in Clontarf in November 1847, Stoker is of course best remembered for his work Dracula. 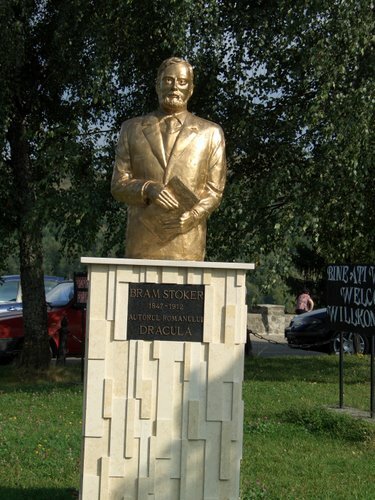 Today, he is remembered with a statue in Bistrita-Nasaud county in northern Romania, a region closely associated with Stoker’s masterpiece. Recently, the Stoker family have come forward as saying they are willing to finance the costs which would need to be met to place a statue to Bram Stoker here in Dublin. 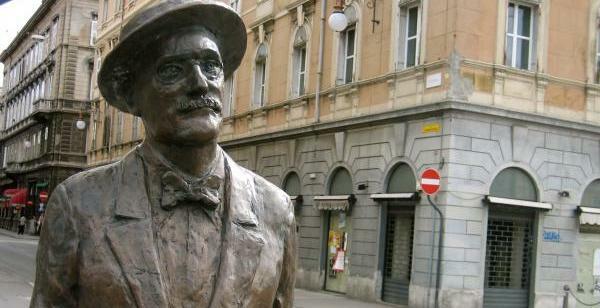 Joyce is remembered in Dublin with a fantastic statue on North Earl Street, but the Dubliner also stands in Trieste, sits in Pula (Croatia) and reflects by his grave in Zurich. 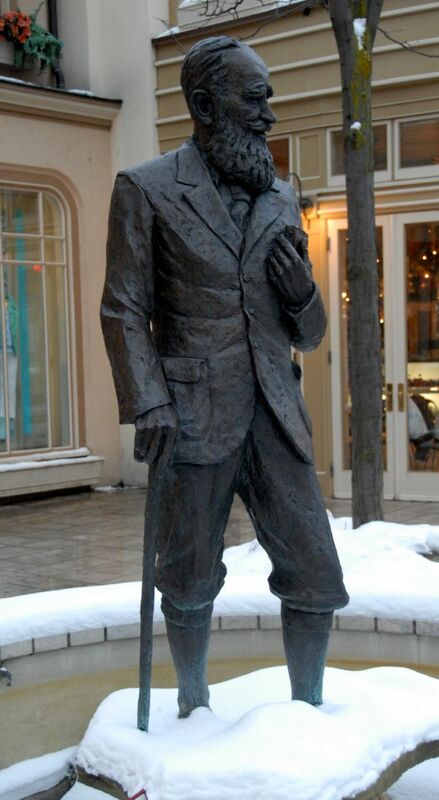 The great George Bernard Shaw, born in Portobello, is remembered with a fine statue in Ontario, Canada. This is where the annual Shaw Festival occurs, a festival dedicated to producing plays written during the lifetime of Shaw. Born in Dublin in 1831, Mackay would die one of the worlds richest men having having made his fortune in mining in the United States. 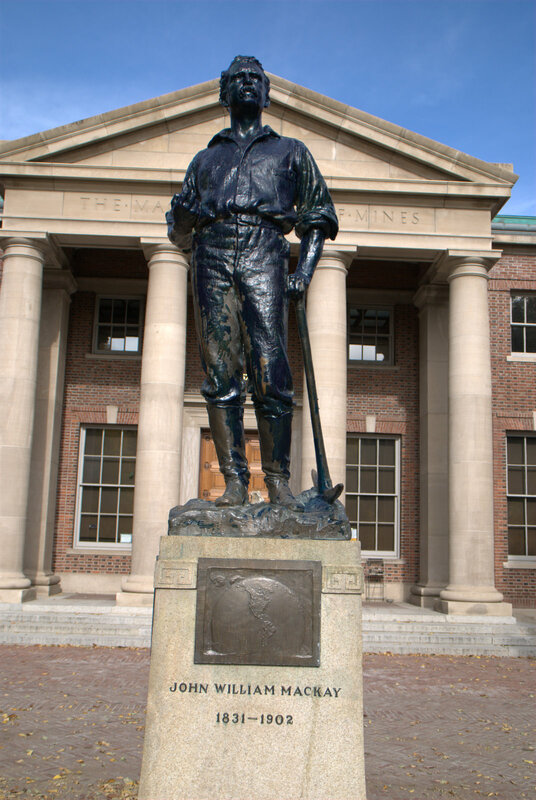 His monument stands today outside the Mackay School of Earth Sciences and Engineering, formerly Mackay School of Mines, at the University of Nevada, Reno. Burke, who gazes over College Green from the front of Trinity College Dublin, is also found in Washington D.C and Bristol, England. The sculpture in the United States is a cast of the original which is on display in Bristol. While Oscar sits proudly in Merrion Square, he is also found relaxing in Tartu, Estonia! The sculpture in front of Café Wilde (sculptor T Kirsipuu, 1999) is a fun speculation about literary history. 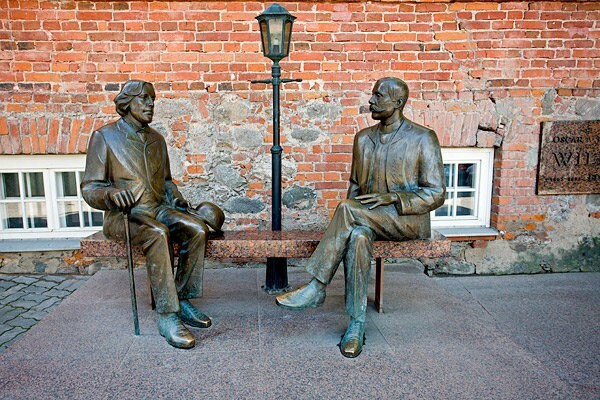 English writer Oscar Wilde (1854-1900), who was born in Ireland, and Estonian writer Eduard Vilde (1856-1933), both of the same generation, sit on a bench together. Any more come to mind? There must be at least a few more, we’d welcome contributions. Any Dublin women abroad? There’s a few statues of famous Irish around South America but I don’t think any of them are Dubs. I suppose you can’t have everything. 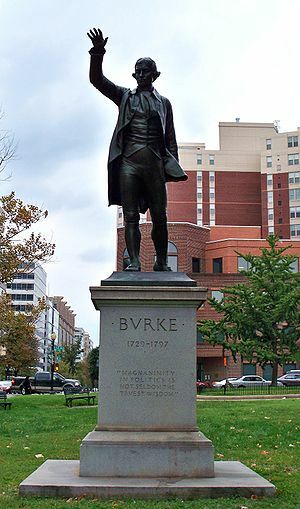 There’s a statue of Edmund Burke in Washington DC. Thanks folks! This continues to grow. Keep ’em coming. Don Patricio O Connel – the Dubliner who saved Barcelona FC (http://www.irishexaminer.com/sport/soccer/a-barry-lyndon-of-the-world-of-football-155896.html) researching it here at Storymap at the moment, has a bust in Nou Camp. And remember seeing the Tartu Wilde, is an exact replica of the one in Galway on the main st.